"This is a Mission Expression Pedal, the EP-1. The volume is one thing that is fairly complicated. We didn't get to see it, but he uses a coiled cable by Divine, Divine Noise Coiled Cable, and it goes behind him right to his amplifiers, not down to the pedalbaord anymore. So because it's coiled and it goes back behind him he doesn't have to grab the cable and move it out of his way anytime or ever anymore. That keeps the signal path really short because, of course, you don't want to have really long cables. We used to have really long cable runs but now we don't. We just have the guitar lead going into the rack and it's parked right behind the amps so it comes right out of the rack and into the amplifiers. So the only long cable is the one on his guitar. That made a complicated situation for the volume. So I was looking for a MIDI volume control device. I found the the Sound Sculpture Volcano. That's up in the rack. It's a little box. This MIssion Expression Pedal actuates the volume via MIDI thorugh the RJM-Gizmo MIDI signal path," explains Dan Auerbach's guitar tech about the Mission Engineering EP-1 Expression Pedal. A good look at 54:07, he uses two of these Mission pedals as expression pedals - though his units have a toe-switch included and the exact model number is covered up. In this photo, which comes from [an interview with Music Radar](http://www.musicradar.com/news/rig-tour-twin-atlantic), the Mission EP-1 can be seen. 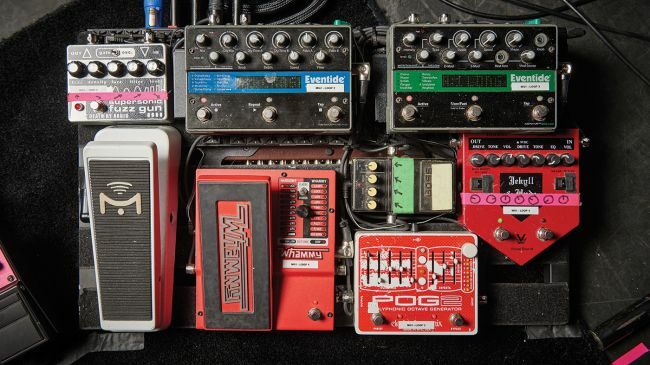 "Waggoner has a few traditional boxes: two Mission Engineering EP-1 expression pedals (to control volume and delay times)"
He has 2 of those expression pedals, according to rig diagram done by Premier Guitar. According to Premier Guitar, Isbell uses the Mission EP-1. At 0:12 minute mark, Adkins's Mission EP-1 pedal can be seen near the RJM controller. "My new pedal from @missionengineering it's wahmazing"
. As far as controllers/pedals for the Axe-FX, I am using a Mission Engineering EP-1 spring-loaded expression pedal for wah and whammy effects. This is a bone simple expression pedal with feels perfect under foot.